You might think that yams are sweet enough, but… if you are Canadian or leave in Canada and have to go through the Canadian winter, you might think that you can’t get enough calories from vegetables alone to keep you warm. Besides, it is likely better for you to have a treat of roasted yams brushed with maple syrup than almost anything you buy already made. The yams are bright orange when they are cooked and certainly, as far as I am concerned, they rival with any candy. It is best to plan the yams for a day when your oven will be on for a while at a medium temperature. First thing to do is to peel them, which is easy enough with a Y-shaped peeler. Do this just before cooking them so they do not discolour. Rub the bottom of a dish with the two halves of a garlic clove, then spread either butter, goose or duck fat, or olive oil (or any combination of these). 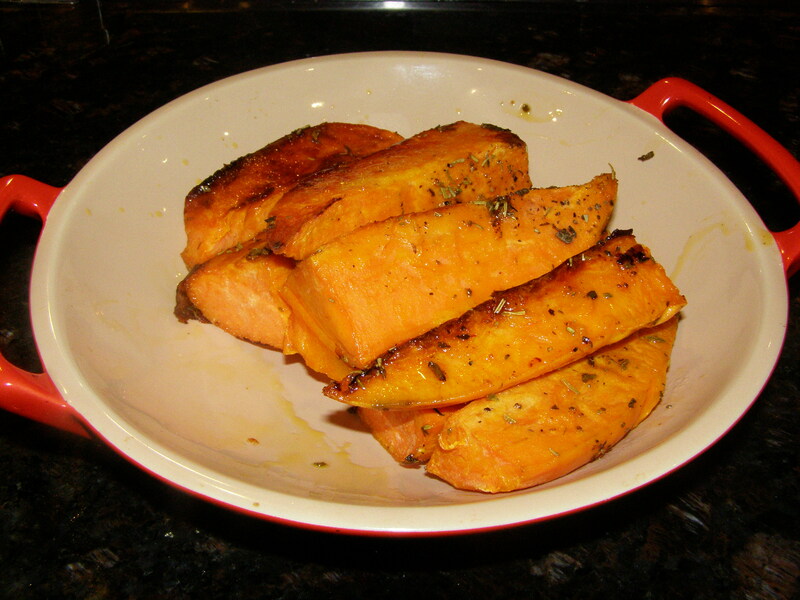 Cut the yams in thick slices or long sticks and rub them in the fat, then turn them over. Sprinkle thyme, oregano and start roasting around 325. Sage is also a good choice and would go well with a pork roast. Turn the yams over a couple time while they cook. When the yams are tender (30 minutes or more depending on the size), paint them with 100% pure Canadian maple syrup, just a light coating, and finish in the oven for another five minutes. Add salt and pepper before serving. Note: It is best to warm up the syrup a little bit as it will spread more easily on the yams, especially if it is kept in the fridge. This entry was posted in Vegetables and tagged food, maple syrup, recipes, roasted yam, Vegetables, vegetarian, verygoodrecipe, yams. Bookmark the permalink.